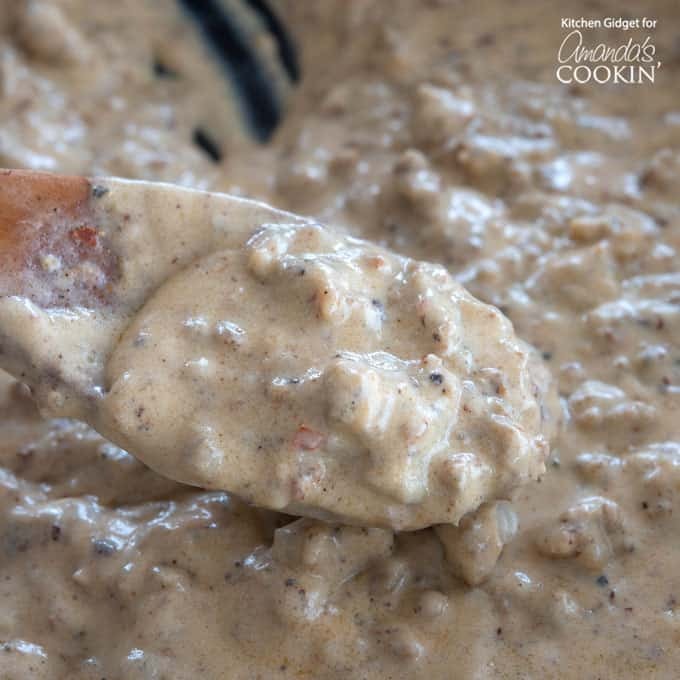 Sausage Gravy: make gravy from scratch in 20 minutes! 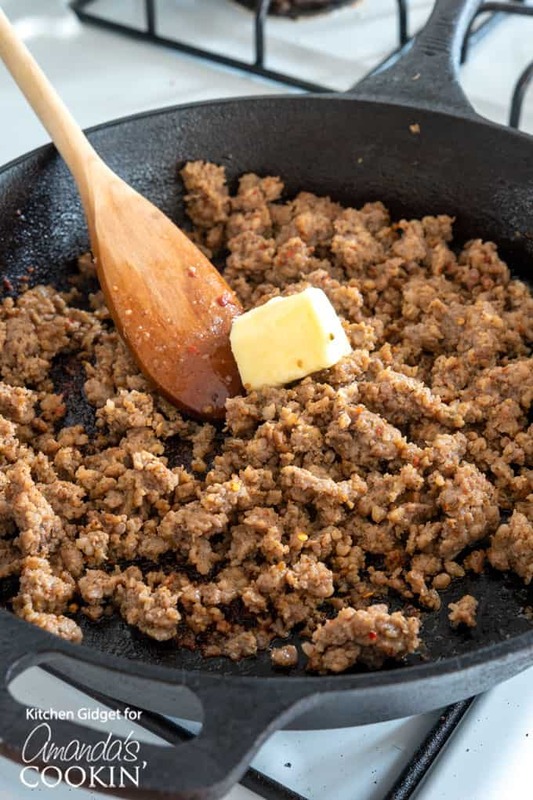 Make sausage gravy from scratch in just 20 minutes with this easy recipe! 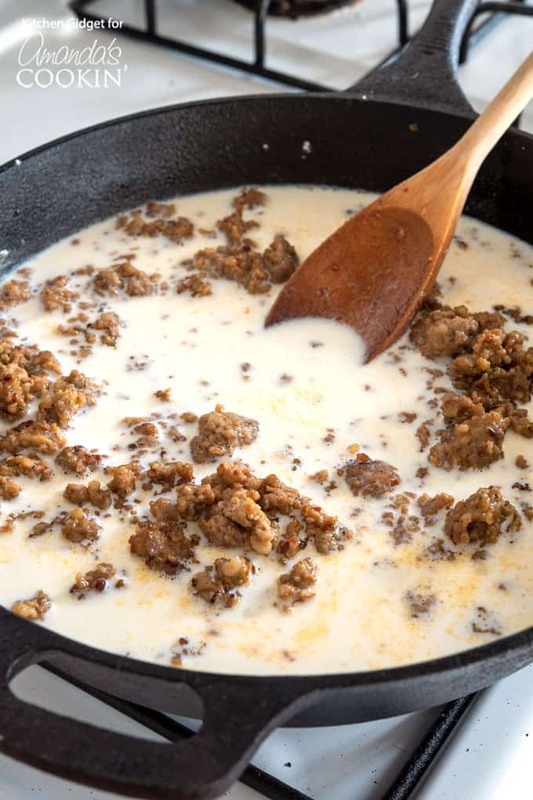 This classic southern dish combines savory sausage crumbles in a thick and creamy, peppery milk gravy. 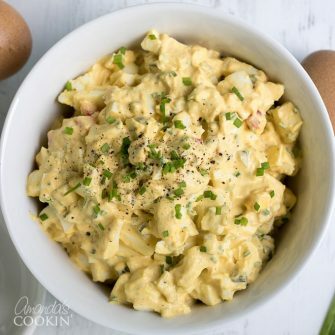 Hearty and delicious comfort food! 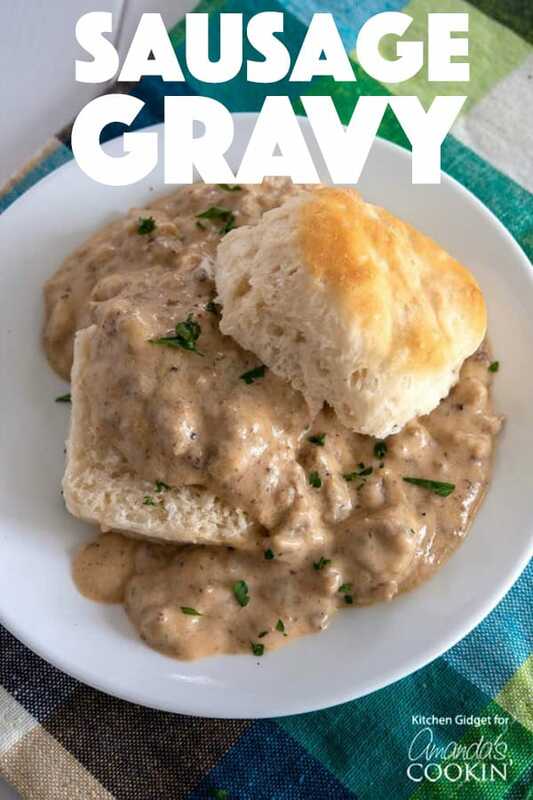 Sausage gravy just might be one of the best recipes in the world. It’s so simple yet so delicious and we eat it for breakfast, lunch, and dinner! Easy enough to throw together when you don’t feel like cooking dinner during the week, but also so incredibly tasty that it’s one of the highlights of our Christmas breakfast. Make this for Mother’s Day and I guarantee she will be impressed! 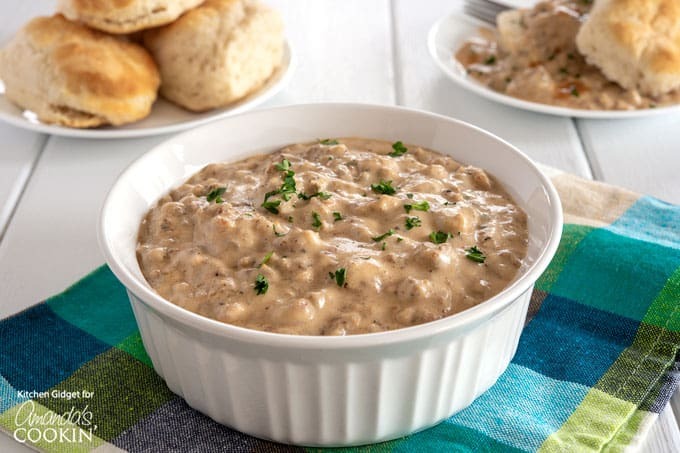 One of the great things is that this sausage gravy will last up to 5 days in the refrigerator so you can even make this ahead of time. For my huge Christmas breakfast last year (serving nearly 20 people) I made a double batch the day before. The next morning I rewarmed it with a bit of milk to thin since it thickens considerably after cooling. I tasted again for salt and pepper and served it in my crock pot so it would stay warm all morning. It was a huge hit along with this Cheesy Hashbrown Potato Casserole. 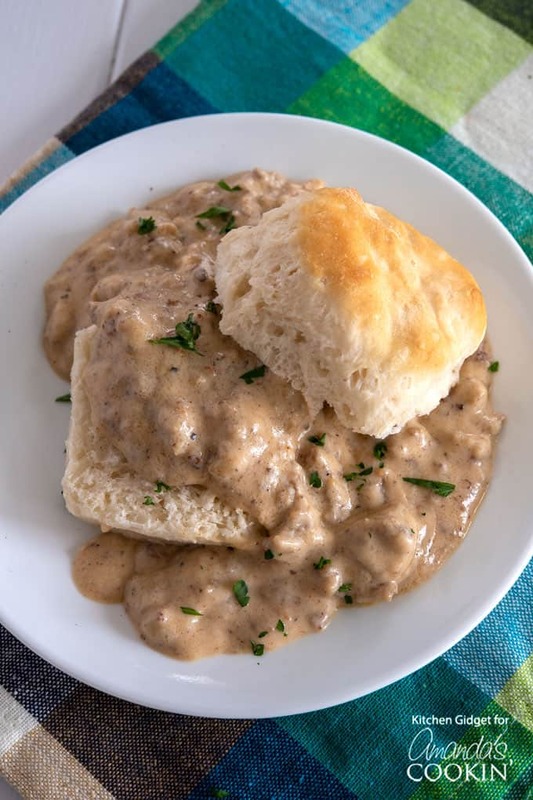 Biscuits are the classic pairing with southern sausage gravy. They go together like peanut butter and jelly. But you can also serve this on toast, over rice or in breakfast tacos! Follow my recipe for Papas con Huevos (potato & egg tacos) and add a spoonful of this in each tortilla along with shredded cheese – amazing. 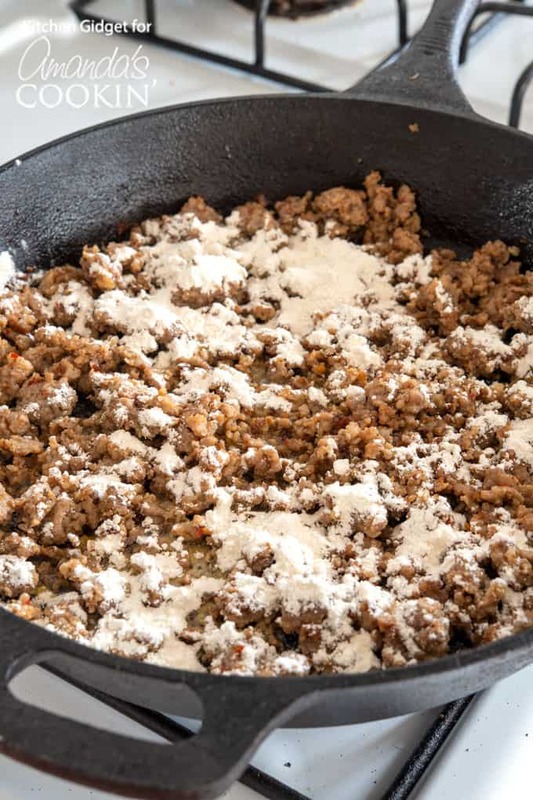 For this recipe you want to use bulk pork sausage. It comes in a tube and it has not been cooked yet. I buy a few of these at a time and keep them on hand in the freezer. You can use a variety of flavors besides “original.” Maple sausage is a good one if you like sweet and savory, or the hot version if you like things spicy. We usually use the hot version plus add extra tabasco sauce as well. Brown the sausage while crumbling into chunks. Add butter and stir until melted. Next, sprinkle with flour. All-purpose flour is used to thicken the gravy. There are other thickening agents, but flour gives it the best taste and texture. It combines with the grease from the sausage and the butter to create a thick paste known as a roux. When you add the milk it will thicken it for a creamy texture. Add the milk slowly and stir the entire time so you don’t get any flour clumps. It will seem watery until it begins to bubble and this can take up to ten minutes. It will continue to thicken as it cools, so I take it off the heat right before my desired consistency. If the gravy is too thick for your liking (or when reheating leftovers) add a splash of milk to thin it. You don’t need to put any other spices except the flavor of the sausage along with salt and pepper. Use freshly ground black pepper if possible, and plenty of it. It should have a robust peppery flavor, but you can adjust to your taste. 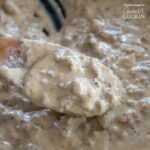 Easy sausage gravy combines fresh pork sausage in a thick peppery milk gravy perfect over biscuits. In a large skillet over medium heat, cook and crumble sausage until no longer pink, about 8 minutes. Stir in the butter until melted, then sprinkle with flour. Stir and cook for 1 minute until flour is absorbed. Add the milk gradually, stirring constantly so there are no lumps. Bring to a simmer, stirring occasionally. This may take 8-10 minutes. After coming to a simmer with lots of bubbling, let cook for 2 full minutes or until thickened. Gravy will continue to thicken as it cools. Stir in salt and pepper. Taste and adjust seasoning if necessary. Rebekah Garcia is the food blogger behind Kitchen Gidget. She creates recipes influenced by her Midwestern roots, Hispanic heritage and insatiable sweet tooth. When she’s not cooking, you can find her at the beach with a good book. She is married to the man of her dreams and home is where the military sends them. She believes food is better when shared…unless it’s the last bite! Love the recipes. Thank you.